Action from the Depiro-Starlites match. In this lively encounter, Athleta came out on top as they recovered from their upset to Floriana in the previous match to go top of the standings alongside PAVI Depiro. Siġġiewi had playmaker Chris Sammut back but pivot Marco Matijevic is still sidelined. For Athleta, rebounder Matthew Zammit made his first appearance this season. With the tall Ivo Hoger showing his prowess in the zone, Siġġiewi were off to an auspicious start but Athleta lifted their game significantly after a time-out. In fact, with Hoger tightly marked, Siġġiewi lost the initiative and Athleta took a 25-19 lead which they preserved to 34-29 at half-time. Siġġiewi were the better team as the third quarter got underway and even took a 47-42 lead but Athleta hit back with Chad Patus and Steve Schembri to put their noses back in front. Baskets at both ends were coming at regular intervals now as Siġġiewi had a few extra chances to regain the lead but they hurried their shots and some of their options were not really the ideal ones to conclude their moves. Then, Siġġiewi’s chances took a nosedive when the unmarked Malcolm Mallia failed to pot an easy shot and from the rebound Michael Naudi was fouled. The Athleta man nailed his two free-throws to ascertain victory. Athleta: M. Naudi 14, D. Bugeja 10, C. Patus 24, W. Spiteri, O. Said 12, S. Pace 2, B. Bartolo, M. Zammit 2, S. Schembri 13. Siġġiewi: C. Doublett, A. Debattista, S. Sammut 16, C. Sammut, N. Falzon, L. Camilleri, A. Borg 7, L. Ross 18, J.P. Antoncich, I. Hoger 25, M. Mallia 8. Referees: E. Mangani, C. Terribile, S. Gouder. Luxol are the first team in the league this season to go beyond the 100-point mark as they had the better of a depleted Floriana side. The champions played superbly in defence against Athleta but this time they were unable to repeat the same kind of display and left huge gaps in their zone which were exploited by the Luxol shooters, particularly Michael Myers Keitt. Derek Elston, the league top scorer, tried to keep Floriana afloat but the Greens paid dearly for their poor show in the middle quarters during which Luxol managed to open a cushion lead. 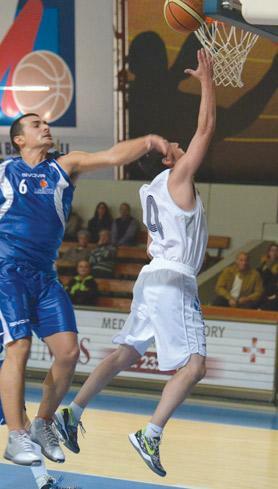 A nervy and disorganised Floriana were trailing by 20 points at half-time (46-26). One expected the Greens to show more commitment when play resumed but Luxol continued to dominate and practically made sure of victory after opening a 77-45 lead. Floriana hit back admirably in the last quarter, gradually eating into their opponents’ lead but their momentum did not last the entire ten minutes as Luxol surpassed a difficult moment to cruise to victory. Luxol: C.J. Cordina 2, M. Mercieca 12, A. Micallef 30, A. Micallef Trigona, N. Vasovic 4, J.P. Schembri 12, M. Myers Keitt 43, S. Capello. Floriana: O. Shamala 2, D. Elston 44, P. Shoults 10, S. Borg, C. Calleja 9, S. Saakian 8, D. Camilleri 7, D. Agius 2. Referees: E. Mangani, S. Gouder, T. Helenius. Depiro imposed their superiority after the interval to achieve a deserved victory and go top of the standings while leaving Starlites still searching for their first league win. Depiro started strongly but Starlites did not give up hope and after a dour second quarter they succeeded in staying in the match as they only trailed by five points at the break – 32-27. But Depiro were in a class of their own in the third quarter as Starlites stumbled while their opponents stretched their lead to 55-29. There was only one team in it now as Starlites failed to get back into the match while Depiro continued to add to their tally for a comfortable win. Depiro: R. Vella 9, N. Sultana 14, T. Morris 36, A. Aquilina 7, A. Portelli 2, A. Axiaq 10, S. Bartolo 9, E. Lupo, I. Tanti 4. Starlites: M. Todorovic 42, R. Loporto 2, R. Bonnici 7, A. Schembri, S. Bonnici, A. Cutajar, M. Vassallo, J. Curmi 1, B. Soler, G. Coleiro. Referees: E. Mangani, C. Terribile, T. Helenius. Standings: Athleta A-Z (3-1) 7, Depiro (3-1) 7, Siġġiewi (2-2) 6, BUPA Luxol (2-2) 6, Floriana Royce (2-2) 6, Starlites (0-4) 4. Top scorers: D. Elston (Floriana) 135, M. Myers Keitt (Luxol) 126, M. Todorovic (Starlites) 115, T. Morris (Depiro) 111, C. Patus (Athleta) 100. Friday (first legs): 13.00 Starlites vs Floriana, 16.30 Siġġiewi vs Mellieħa, 18.15 Athleta vs Depiro. Sunday (second legs): 13.00 Floriana vs Starlites, 16.30 Mellieħa vs Siġġiewi, 18.15 Depiro vs Athleta.